The Disney company is introducing its first new princess in 11 years this fall and her name is Princess Tiana. She is the star of the upcoming animated musical, The Princess and the Frog, which will be in theaters this December. Meet first African American princess, Princess Tiana and friends using our latest printable word search. 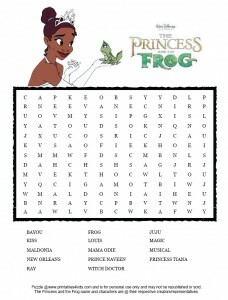 Click on the image above to print the Princess and the Frog Word Search Puzzle. You might also like our Princess and the Frog Movie coloring pages, mazes and connect the dot activities. Something tells me Princess Tiana is going to be very popular this Halloween as the Princess Tiana costume is absolutely gorgeous. The theme will quickly become one of the most popular birthday party themes, I’m sure, and her toys and games will be hot this holiday season too.